Like the previously reviewed Spider Baby, The Skull is a movie I had heard about but hadn't seen until very recently. For some reason, I had it in my mind that it was a more obscure Hammer title, but in fact it's an Amicus release. If that name doesn't sound familiar, I'd be willing to wager that most horror fans have seen at least one of their anthology films*: Tales from the Crypt, The Vault of Horror, From Beyond the Grave, Dr. Terror's House of Horror, Asylum, or The House that Dripped Blood. 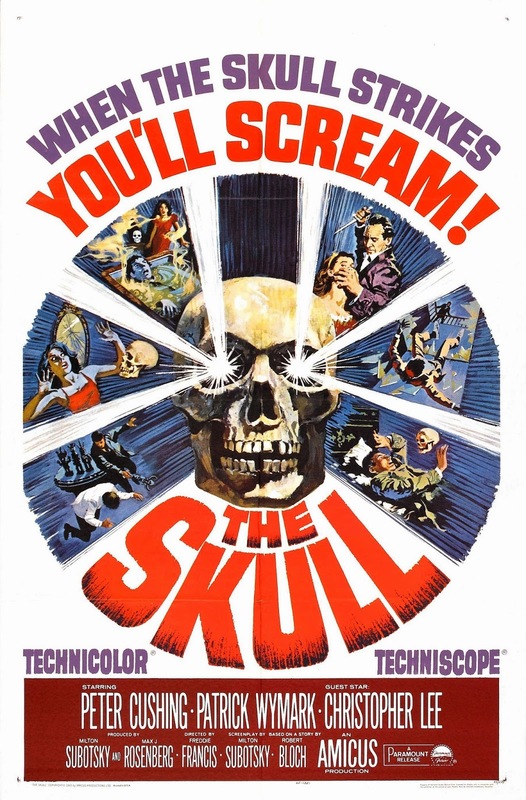 The Skull is one of their non-anthology releases, and while it's a minor entry in the realm of British Horror, there are enough creepy and / or surreal flourishes to recommend the film - if you can find it. If this were a spoiler, I'd mark it accordingly, but before any character identifies the person who the titular object belongs to, the credits give it away by saying the film is based on Robert Bloch's "The Skull of the Marquis de Sade." After a prologue where a grave robbing phrenologist (Maurice Good) steals the Marquis' head and meets and unfortunate end for it, we move to modern day London. Amateur demonologist and collector Dr. Christopher Maitland (Peter Cushing) is at an auction and in a friendly bidding war with fellow collector Sir Matthew Phillips ("Guest Star" Christopher Lee) over a few statues representing Hell's hierarchy. Phillips bids far more than the statues are worth, but cannot explain why he was so intent on purchasing them. Maitland returns home, and is visited by the unsavory Anthony Marco (Patrick Wymark), who "acquires" rare pieces and sells them - cash only, please. He offers Maitland a copy of The Life of the Marquis de Sade, a book bound in human flesh, with a promise he has something "even more interesting" to bring the next night. Despite Maitland's wife, Jane (Jill Bennett)'s protestations, Marco prefers to let himself in, and the good doctor tells him that Marco is "always welcome." The following night, Marco brings along the skull of the Marquis de Sade, and seems willing to part with it for less than his initial offering price. Maitland is suspicious that it's stolen, and his suspicions are concerned when Phillips vouches for the authenticity of the object. It was stolen from him, and he doesn't want it back: the skull of the Marquis de Sade brings with it evil spirits who drive men to do horrible things during the new moon. But as The Skull is a horror movie, we know that Maitland will give in to temptation. It's a "curiosity killed the cat" sort of story, and while it sometimes drags a bit during its 83 minutes, once the skull starts working on Maitland, there are a few stylistic flourishes that keep you invested. The film features a rare pairing of Cushing and Lee where the latter is the voice of reason, which is worth watching, and there are a few small parts for recognizable British actors: Michael Gough (Batman) appears early as an auctioneer, and Patrick Magee (Die, Monster, Die!) is the police surgeon baffled by the means in which Marco meets his end (SPOILER). Genre go-to director Freddie Francis (Tales That Witness Madness) stages Marco's death scene without ever showing him die, in what is both an excellent bit of narrative suggestion but also a surreal break in the mostly straightforward narrative. Maitland hasn't decided to buy the skull yet, and is sitting in his study reading The Life of the Marquis de Sade, when his window begins to glow a strange green hue. Two policemen arrive and inform him he's under arrest, but will not tell him what he's charged with. Instead of taking him to the station, he finds himself in a large, mostly empty room. In the center is the Judge (Frank Forsyth), who never utters a word but instructs the "police" to force Maitland to play a game of Russian Roulette. When he lives, he's shoved into a red room which serves as a sort of "gas chamber" and awakens to find himself in the stairwell of Marco's apartment, a place he's never been before. Thanks to a flashback to the phrenologist's home, where his Executor is hypnotized by the skull and murders the dead man's mistress, we know that the skull is capable of creating a trance-like state, but the dream sequence adds a better sense of mystery to The Skull's midpoint. It also introduces the stairwell for a scene later, when Maitland returns to take the skull and confronts Marco's landlord (Peter Woodthorpe), leading to a death scene that may well have influenced the "stained glass" kill in Suspiria. I certainly thought of Argento's film when it happened, although the latter film embellishes the end result more than the earlier one does. There are several moments throughout the second half of The Skull with suspense and atmosphere, and despite some obvious wires carrying it around, the image of the floating head is striking. The (mostly) wordless climactic battle of wills between Maitland and the evil spirits goes on for far too long and becomes bogged down with awkwardly place religious imagery (although the return of one of the statues from the beginning is a nice touch). I get the impression that Francis and screenwriter Milton Subotsky (I, Monster) were trying to whip the audience into a frenzy of terror, but the lasting impression is more of histrionics than fear. I appreciate the ending, but at times it feels that The Skull might have been better as a part of an anthology rather than a feature unto itself. Still, for fans of Peter Cushing and Christopher Lee, it's worth seeking out as a minor chiller. *They also released both of the Peter Cushing "Dr. Who" movies, but we won't get into that.